30cm HDMI 1 Male to 2 Female Splitter Adapter Cable. 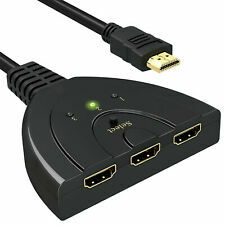 Conveniently split one channel HDMI signal into two channels HDMI signal. Enables two HDMI sockets to be connected in a single HDMI plug and transmit clear high-definition digital audio and video signal. 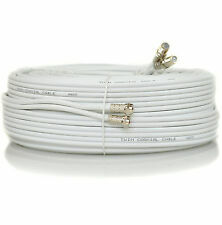 These RF aerial fly leads are used for connecting a TV, VCR or similar device to an aerial outlet. They are white in colour with moulded connectors and use double screened cable to minimize external interference. Sky & Freesat. Sky Dishes. Twin Type Cable Clip. Single Type Cable Clip. 4 Fitted F connectors & 2 Joining Barrels. 2 x High Quality Twist on Joining Barrels ( Pre Fitted ). 4 x High Quality Twist on F Connectors ( Pre Fitted ). 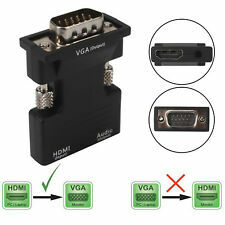 1 x 1080P HDMI Male to VGA Male Cable 1m. If both input/output device does not support signal conversion, a signal conversion box is required. 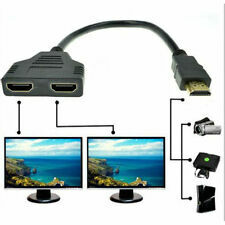 HDMI to VGA cable is designed to connect and transfer signals from HDMI port to VGA port. SKU : 006555. This cable has a male RF (Push in type) connection on one side and a Female RF Socket the other. Coaxial Cable Type:RG59/U. Connector Type B:Socket. Five inputs accommodate the simultaneous connection of high definition video sources, such as HD player, Blu-ray player, Set Top Box, P&S3, Xbox360 etc. The output sends the high definition audio/video signals to a high definition display like HDTV. TV AERIAL CONNECT PLUGS. 2 x FEMALE. Size: 5 x 4 x 1.7 cm. What is in the box. Sky & Freesat. Sky Dishes. Twin Type Cable Clip. Single Type Cable Clip. 4 Fitted F connectors 2 Joining B arrels. 2 x High Quality Twist on Joining Barrels ( Pre Fitted ). 4 x High Quality Twist on F Connectors ( Pre Fitted ). COMPATIBLE WITH ALL HD,3D AND 4K UHD OLED DEVICES (you must need 4k hdmi cables and DHCP option off). Support 1.4v and 2.0v hdmi cables. 3D support. Support 5.1 & 7.1 audio. Watch on two tv simultaneously. UK 1080P 3 Port HDMI Switch Splitter Switcher HUB Box Cable LCD HDTV. 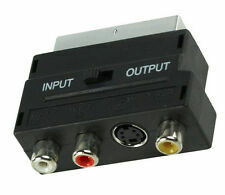 Laptone’s HDMI 3x1 Pigtail Switch Selector, 3 Input 1 Output. With one fixed HDMI cable (pigtail). When one device is turned off, the pigtail switcher will automatically select the next device, or you can manually select with the button too. To use this cable, your display must be a high definition display. The cable doesn't own the chip to convert digital signals to analog signals, so it only fits for the devices which itself can convert digital signals to analog signals, this product is the Component Adapter Cable only! The Adapter is Rohs Compliant for the Highest Material Standard in the EU. Side A: Coax Male. No Extra power adapter requaired, Plug and Play.What a convenient and cost-effective solution! No more hassles of manually plugging in different HDMI connectors to view different HDMI sources. Individual LED Display of video source channels. 3 RCA / Phono Male Plug to 3 RCA / Phono Male Plug Cable. Triple RCA / Phono AV Audio Video Lead with Yellow White & Red Plugs. SKU : 005695. Convert a HDMI cable into a DVI D 24 1 pin connection. DVI has no sound, so sound has to added from another source. 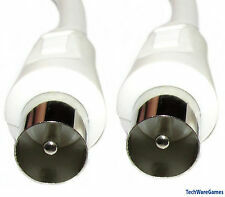 These aerial fly leads are used for connecting TVs, VCRs, Sky and similar devices together. They may also be used to extend an existing RF aerial cable. Nickel Plated Cable. High Quality Molded Cable. Simply plug standard composite AV cables (yellow, red, and white) into the input port of the converter, and then connect an HDMI cable from the converter to your TV. This converter works great with either720p or 1080p TVs, and the output mode is easily selectable with a switch on the device. These High Quality aerial fly leads are used for connecting a TV, VCR or similar device to an aerial outlet. They are white in colour with molded connectors and use double screened cable to minimize external interference.